Whether you’re looking to shed some pounds or add some muscle to your physique, a kitchen scale is an essential tool. A kitchen scale can help ensure that you’re accurately measuring your food. Often, food labels are vague, only listing the weight of the food and not actual serving sizes. So, if you want to be more accurate with the food you’re putting into your body, a food scale can be a real game changer. Use one to help you when you’re on a diet, multiplying recipes, or creating equal portions. 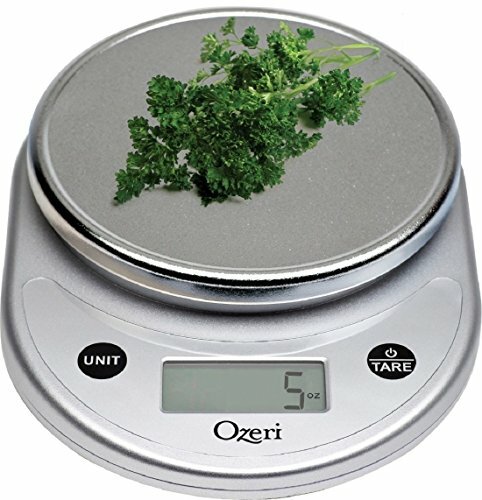 The Ozeri Pronto Digital Food Scale is a scale that is designed to help you measure out your food or ingredients. Food scales have been around for a very long time. You may have seen your grandparents or parents use those old scales that weigh with a pointer and have no digital output. The issue with those is that they can be very inaccurate and malfunction after extended use. Since those times, they have been developed to be quick and easy to use and are designed to be very accurate, unlike those older models. This product has since then been designed to be accurate, elegant looking, and weights food with a precision of within a 1 gr rate of error. Many people believe that they don’t need a scale for their food, but the truth is that it can come in handy in more situations than you can think. If you’re meal prepping or on a strict diet, weighing your food can help you keep track of the food you’re eating. If you’re an avid cooker or baker, this scale is a life saver. When you’re following recipes, they will usually call for specific measurements, and while other methods can be easy to use, they aren’t as accurate. If you happen to work in the food industry a food scale can help you ensure that your products are the exact same size. 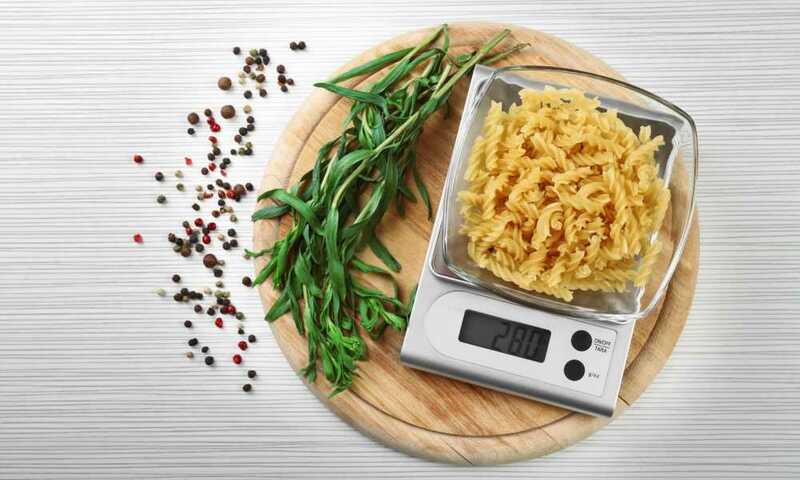 As you can see, food scales can be an essential tool in any kitchen. You will receive the Ozeri Pronto Digital Food Scale and a set of AAA batteries to power the scale when purchasing this product. It’s highly recommended to buy some extra containers when purchasing this product. This is because you can “zero-out” the weight of food containers, thus if you’re cooking or baking extra bowls and cups can come in handy. This will help you with easier clean up and you won’t have to constantly be zeroing out different bowls or cups. This food scale comes with an elegant design that comes in multiple different variations of colors; black, lime green, red, silver, silver on black, teal blue, and white. The scale itself can weigh out foods as heavy to 11.24 lbs., which is an amazingly high amount for a kitchen scale. It has an automatic button that will instantly convert the units of measurements – grams, pounds, pounds/ounces, ounces, and ml. All the measurements and information are displayed on an easy-to-read LCD screen. There is a button included on the food scale that will instantly zero out any containers or weight previously on top of the scale. The product runs on 2 AAA batteries that are included and the scale will automatically power off after 2 minutes of no use, making sure to preserve battery power. To use the food scale, simply put the batteries into the battery compartment and select the type of measurement scale you’d like to use. Scale out any containers, cups, or bowls, and then place the food inside. If you would like to switch between measurement units, click the button. The measurement will be displayed on the easy-to-read LCD screen. After you’re done using the system, put it back in storage and it will automatically power off after 2 minutes of non-use. If desired, you can weigh out the foods without putting them in a container first. To wash, very carefully use soap and water and wipe gently on the scale; never fully submerge it in the water. If you’re not completely satisfied or sold on purchasing this food scale, we can recommend another one to you. The Etekcity Digital Food Scale is another great food scale that can measure up to 11 lbs. It includes a scale system that has a detachable bowl; you can choose to either weigh your food with the bowl or use a different measuring container, or none at all. It can measure in these units: pounds, ounces, grams, ml, and fluid ounces. This system is very accurate and has a very small margin of error, of up to 0.1 oz. It also can “zero-out” any weight that is put onto the scale. One of the key features to this bowl is that you can use the bowl to help mix both wet and dry ingredients for dips, dressings, and batters; the scale can differentiate between density of water and ingredients, letting you know how much you are using. As you can see, a kitchen scale can be very useful for many types of applications. Remember that you don’t have to limit the use of the kitchen scale to just kitchen-related projects. Use it for hobbies and activities of up to around 11 lbs. Kitchen scales are more accurate than other types of measuring tools, and they can easily zero out any other ingredients so that you don't’ have to constantly switch between bowls or containers. Hopefully, this review has helped you decide whether you like this model or not.